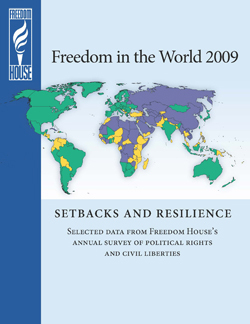 Report details a third consecutive year of human rights setbacks throughout the world. The annual report written by Freedom House that details the level of political and civil liberty enjoyed by people across the world has noted a decline in human rights for the third consecutive year. South Asia experienced modest improvements but Sub Saharan Africa and the Baltic states continue to regress according to the US based research institute. UNPO members Taiwan have been praised for the progress they have made, but several other regions have seen great setbacks. China was criticized for its clampdown on civil liberties during the Olympics, and for not fulfilling its promise to improve its track record. Indeed, it was calculated that over half of the entire global population that Freedom House deem to live in “not free” conditions, reside in China. A Not Free country is defined as a state “where basic political rights are absent, and basic civil liberties are widely and systematically denied.” China was highly criticized for its repression of Tibetan and Uyghur communities, the former seeing a downturn in its rating due to the increase in military presence and restrictions on freedom of movement. Burma was also rated amongst the “worst of the worst” for political and civil liberties, largely due to severe crackdowns on political activists in the country. For an introductory essay by Freedom House, please click here .